When business leaders find themselves frustrated by lack of focus, being easily distracted, working hard but not getting results, becoming indecisive, or feeling uncertain about what their priorities should be… chances are, they’re overlooking the age-old success secret belabored so much by success masters and mentors, it’s no longer a secret. It’s in plain sight… there for any ambitious entrepreneur or executive to grab hold of and run with. But so many don’t. And many who do, don’t get it right, don’t apply it consistently, or simply forget about it. The by-product of this crucial oversight is a frustrating situation too many business leaders face too often… but could easily avoid. Starting with a clear objective, goal, or end in mind, is common knowledge, yet it’s not common practice! In 1989, Stephen Covey’s timeless bestseller “The 7 Habits of Highly Effective People” really brought home the importance of setting clear goals in the second habit, “Begin with the end in mind”. While most people understand the principle and may even apply it at the outset of a project, the key to its effectiveness (and the part most people get wrong) is the bit about it being a HABIT. If business leaders knew that setting clear goals was not only important, but vital to determining how fast they climb the success ladder, we’d be seeing much clearer goals being set, more often and hearing about many more success stories… and fewer stories of struggle, or sad endings. 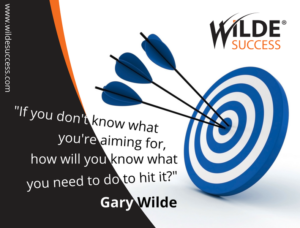 If we don’t know exactly what we’re aiming for, how will we know what we need to do, to hit it? Or how will we know WHEN we’ve hit it? Goals influence our thoughts, decisions and actions and ultimately the results we achieve and are critical to our rate of success and level of success in business. A misconception that’s become embedded in business, is that goal setting is something you do once a year and review quarterly or every six months. It’s often a process that’s been relegated to a box ticking exercise both leaders and staff dread. Small wonder so few have mastered this skill. Successful business leaders know exactly what they want to achieve, every day, week, month and year, which means they’re constantly focusing their thoughts and decisions entirely on how they can use their time, energy, money and resources to achieve these goals, in the most efficient and cost-effective manner. 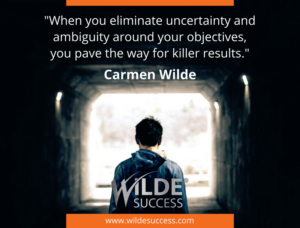 When you eliminate uncertainty and ambiguity around your objectives, you pave the way for killer results. Which is why it’s become an embedded habit for successful business leaders… so much so, they even set goals unconsciously throughout their day. When you leverage the power of clear goals, you increase your chances of achieving your goals. When we set clear and specific business goals or objectives, we’re painting a clear target that our mind quickly orientates itself towards. With a clear target in sight, the mind immediately begins searching for opportunities and formulating solutions that will drive us towards the achievement of those goals. As a Business Coach & Breakthrough Specialist, my first port of call in any coaching intervention is to establish whether the business objectives are clear and specific across time frames, or not. If they’re vague or unclear, this is what we rectify first. E.g. If a goal is to “Significantly increase profits”, no-one has a clear picture of what they’re aiming for, or what the measure of success is. If the goal is to ‘increase profit after tax by 25% by “x” date without increasing costs,’ now the mind has a very clear picture to work with. This makes it easier to find the “how” and formulate well-coordinated milestones and plans to achieve your objectives. When you start every day, task, meeting, project, conversation etc. with a clearly defined objective, the laser beam focus removes the clutter and distraction, and enables you to get the result you want faster. Paint your target clearly, and jet set towards success! Vague goals can be likened to a hot air balloon at the mercy of the elements. You can never be sure where you’re going to land. 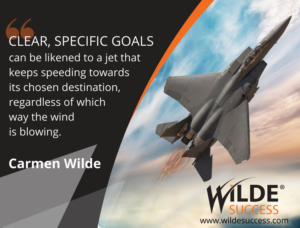 In stark contrast, clear specific goals can be likened to a jet that keeps speeding towards its chosen destination, regardless of which way the wind is blowing. When you make it your highest priority to set goals throughout your day, every day, it’ll become a habit. It becomes easy to do, all the time, with little effort. When you’re armed with this kind of clarity, all day, every day, you become laser focused, decisive, confident, and driven. You know what to say “Yes” to and what to say “No” to. 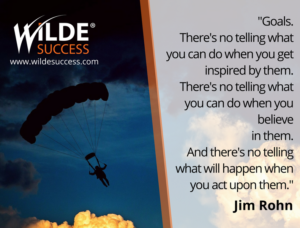 You become an inspiring leader who drives action with purpose and delivers results. You become unstoppable. So, if you want to be the next Wilde Success story… take this success secret to heart, get clear on your goals and start everything, every day, with your goals in sight. P.S. I’d love to hear your thoughts. Comment below on how goals have supported you in driving up results in your business and if you liked the post, share the love via the social media icons.